YOU ARE BUYING OE QUALITY FRONT BRAKE PADS. 1 x SET(4) FRONT BRAKE PADS. WE ALSO DO OTHER BRAKE PARTS, DISCS, BEARINGS, SHOES, CYLINDERS, CABLES, FOR THIS VEHICLE -. Please read full listing description carefuly before you order to make sure the part does fit your car. 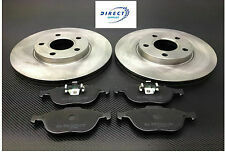 - FORD TRANSIT 2.0 TDCi FWD 2000-2006 FRONT BRAKE DISCS AND PADS SET & REAR SHOES. Brake Shoe Adjusters. Main Bearings. 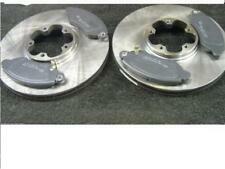 PAIR OF FRONT BRAKE DISCS. Brake Hoses. Brake Master Cylinders. Front Brakes. Rear Brakes. Misc Brake Pads. Please read full listing description carefuly before you order to make sure the part does fit your car. - FORD TRANSIT 2000-2006 RWD MINTEX FRONT 2 BRAKE DISCS AND PADS SET NEW. TOURNEO CONNECT 1.8 1753 Diesel 75 6/2002 >. TOURNEO CONNECT 1.8 1753 Diesel 90 6/2002 >. TOURNEO CONNECT 1.8 1796 Petrol 116 6/2002 >. TOURNEO CONNECT 1.8 1753 Diesel 110 8/2006 >. 1 X NEW REAR WHEEL BEARING HUB ASSEMBLY WITH WHEEL BEARING -. TOURNEO CONNECT 1.8 1753 Diesel 75 6/2002 >. TOURNEO CONNECT 1.8 1753 Diesel 90 6/2002 >. TOURNEO CONNECT 1.8 1796 Petrol 116 6/2002 >. TOURNEO CONNECT 1.8 1753 Diesel 110 8/2006 >. 1 X NEW FRONT WHEEL BEARING KIT. EBC Part Code: D1320. The high quality grey iron in their standard disc range includes copper to increase thermal conductivity and wear properties. EBC Automotive brake discs are made from G3000 specification cast iron and are superior in quality and performance to other standard discs. EBC Part Code: D1235. The high quality grey iron in their standard disc range includes copper to increase thermal conductivity and wear properties. EBC Automotive brake discs are made from G3000 specification cast iron and are superior in quality and performance to other standard discs. MPN - ADB31107 ADC1214V. 2. 0 DI 2.0 TDCi 2.3. (INCLUDES DISC BRAKE, BRAKE PAD). FRONT AXLE BRAKE SET. The information provided in the compatibility should be used as a guide only. BRAKE DISC THICKNESS - 24,5 mm. Please read full listing description carefuly before you order to make sure the part does fit your car. - FORD TRANSIT 2.0 TDCi FWD 2000-2006 FRONT BRAKE DISCS AND PADS SET NEW. Caliper Rebuild / Repair Kits. Brake Caliper Slider Pins. Brake Caliper Pistons. Caliper Repair / Service Kits. This is a Seinsa Autofren premium quality caliper rebuild kit with parts for one brake caliper. Quantity Unit Pair. for brake disc thickness 24 mm. Function Brake Disc. Brake ENGINEERING DI956228. Minimum thickness 22 mm. Cross references. FORD TOURNEO CONNECT 1.8 TDCi MPV Diesel 06/2002 12/2013 FWD 8 90 66. Quantity Unit Pair. for brake disc thickness 24.5 mm. Function Brake Disc. Brake ENGINEERING DI956077, 956077. Cross references. FORD 1456667 1473008 1520371 1568654 1738807 1C1J1125A2D 1C1W1125AA 1C1W1125AB 4041427 4395257 K1W-1125-AA K1W1125AA. High Quality Brake Discs & Pads Available! UK Seller! Brake discs. Bolt Hole Circle ( mm ): 108 mm. Position: Rear. Our Part No's / OE PART NUMBER VAPADC1226-B. Number of Bores: #. Number of Holes: 5 Holes. Please read full listing description carefuly before you order to make sure the part does fit your car. - FORD TRANSIT RWD FRONT 2 BRAKE DISCS & PADS REAR DRUMS SHOES WHEEL CYLINDERS X2. One Pair of Brake Discs. One Set Of 4 Brake Pads. Brake Disc Thickness 24.3 mm. Function Brake Disc. BRAKE PARTS INC. 956077. Cross references. FORD 1C1W1125AA 1C1W1125AB 4041427 4395257. Fitting Position: Front Axle; Brake System: Bosch. Fitting Position: Front Axle. FORD TOURNEO CONNECT 1.8 16V TDCi 2.0 ELECTRIC. Hole Pitch / Number - 05/05. DISC BRAKES (PAIR). Bolt Hole Circle Ø - 108,0 mm. Brake Disc Thickness - 24,0 mm. The information provided in the compatibility should be used as a guide only. 2 HIGH QUALITY MINTEX BRAKE DISCS. FIT MINTEX. FRONT BRAKE DISCS. PUT YOUR SAFETY FIRST. AND PARTS COMPATIBILITY LIST INCLUDING THE "NOTES" SECTION ON THE LEFT. TO MAKE SURE THERE ARE NO VARIATIONS RELATING TO YOUR PARTICULAR MODEL. FRONT BRAKE DISCS 294MM. AND BRAKE PADS. LPB BRAKE DISCS. AB TEX PLUS PADS. REAR WHEEL DRIVE. FRONT BRAKE. VERY HIGHPREMIUM QUALITY. 'E' MARKED AND 90R REGULATED. Brake Disc Type Solid. Quantity Unit Pair. for brake disc thickness 11 mm. Function Brake Disc. Brake ENGINEERING DI956229. Cross references. Fitting Position: Rear Axle; Brake System: for vehicles with disc brakes on the rear axle. Motaquip are an automotive parts supplier with a unique history forged at the heart of the United Kingdom’s motor industry over three decades ago. Motaquip Coated Brake Disc. Search “Motaquip Auto Spares E-Catalogue”. Hole Pitch / Number. NOTE: THE COMPATIBILITY LIST IS FOR GUIDANCE PURPOSE. Brake Friction. Brake Disc Type. Brake Disc Thickness. Bolt Hole Circle Ø. New Land Rover Freelander 2.0 TD4 00-06 Rear Exhaust Silencer Back Box - LR188W.GBP 29.50 View Item. Brake Disc Type Solid. Brake Disc Thickness 11 mm. Function Brake Disc. Cross references. FORD TOURNEO CONNECT 1.8 TDCi MPV Diesel 06/2002 12/2013 FWD 8 90 66. FORD TOURNEO CONNECT 1.8 16V MPV Petrol 06/2002 12/2013 FWD 16 116 85. QH Benelux 58080. Brake Disc Thickness 24 mm. Function Brake Disc. Cross references. Minimum thickness 22 mm. FORD 2T141125CA 2T141125CB 2T141125EA 2T141125EB 4367104 4367106 4455980 4457985. FORD TOURNEO CONNECT 1.8 TDCi MPV Diesel 06/2002 12/2013 FWD 8 90 66. 1 x Set Of Front Brake Pads (Both Wheels). 12 MONTH WARRANTY. 4387352 (2T14-2K286-AA). 4387348 (2T14-2261-AA). 5039062 (2T14-2261-AB). 4387350 (2T14-2A225-AA). 5039023 (2T14-2A225-AB). 5039061 (2T14-2200-AC). They fit most Connect variants including P65, P70 and P80, 1.8 Diesel. QH Benelux 58185. Brake Disc Type Solid. Brake Disc Thickness 11 mm. FORD TOURNEO CONNECT 1.8 16V MPV Petrol 06/2002 12/2013 FWD 16 116 85. Function Brake Disc. FORD TOURNEO CONNECT 1.8 TDCi MPV Diesel 08/2006 12/2013 FWD 8 110 81. 2 x FRONT VENTED 276mm BRAKE DISC 1 x FRONT BRAKE PADS SET TO FIT: FORD TRANSIT 2000-2006 ALL FRONT WHEEL DRIVE MODELS WITH 276mm DISCS.